Dustin Lee Hoffman (b. 1937) was born in Los Angeles to a family with Ukrainian-, Polish-, and Romanian-Jewish ancestry. His father was a set decorator who worked for Columbia Pictures, which likely influenced Hoffman to dream of becoming an actor. His family didn’t share this dream, and Hoffman went to college with plans to become a doctor. He dropped out after one year and joined the Pasadena Playhouse. There, he met fellow actor Gene Hackman, and the two soon moved to New York and shared an apartment (together with Robert Duvall). Hoffman had small roles in film and television over the next decade. His first lead role was in 1967’s The Graduate (the famous “Mrs. Robinson” movie), which was wildly popular and earned him an Oscar nomination. The film was hailed as a breakthrough, with Hoffman said to represent “a new breed of actor” – more human, more complex, and not the perfectly-looking stud that Hollywood employed in those days. It was said that “Hoffman’s character made conventional good looks no longer necessary on screen.” Despite the success, Hoffman turned down film in favour of the stage, starring on Broadway where he won an award for outstanding performance. It wasn’t long before Hoffman returned to film, in 1969’s Midnight Cowboy, and incredibly, was nominated for an Oscar once again. (The Library of Congress later included this iconic film in its registry for preservation.) All in all, Hoffman appeared in 6 plays, 16 TV shows, and some 60 films. He was nominated for Best Actor at the Oscars seven times, winning twice (for Kramer vs. Kramer and Rain Man); and won 6 Golden Globes as well. In recent years, he has reconnected with his Jewish roots, taken on more Torah observance, made sure that his children and grandchildren have bar and bat mitzvahs, and aims to learn Hebrew. Hoffman was recently hailed as one of the greatest performers of all time, and “one of the most versatile and iconoclastic actors of this or any other generation”. Last week he celebrated his 80th birthday. 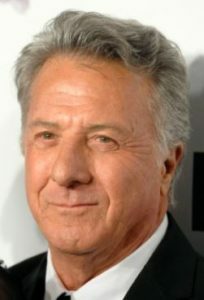 This entry was posted in Arts & Entertainment and tagged American Jews, Dustin Hoffman, Golden Globes, Hollywood, Is Dustin Hoffman Jewish, Kramer vs. Kramer, Los Angeles, Mrs. Robinson, Oscar Winners, Pasadena Playhouse, Polish Jews, Rain Man, Romanian Jews, The Graduate, Ukrainian Jews on August 16, 2017 by Jew of the Week.